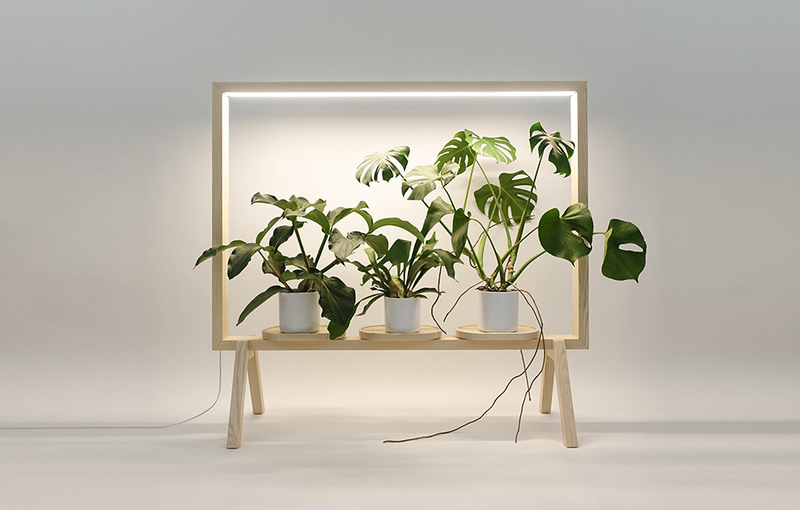 GreenFrame is a floor screen for potted plants with integrated lighting, designed by Johan Kauppi for Glimakra of Sweden, and will be premiered during the Stockholm Furniture Fair in 2018. GreenFrame allows plants to play a prominent role in interiors, even where daylight may not be enough. GreenFrame is a modern wood furniture, ambitiously made entirely in massive ash with advanced details, contributing to a better indoor climate, nicer workplaces and happier plants. In Scandinavia, we have fewer hours of daylight during the dark half of the year and light support is often needed when overwintering potted plants. The screens can be individually furnished as a green oasis in the middle of a room, or as exciting backscene adjacent to walls. They can also be repeated in long lines or set in angles. The frames are stable and airy constructed, which allows the chosen plants to influence the appearance of the screens. Limbus GreenFrame can be considered a sibling to the sound absorbing floor screens Limbus Subtle, also from Glimakra of Sweden (exclusively published by Designboom 2017 and German Design Award Winner 2018), sharing the same dimensions and significant wooden legs. But by all means they are each other’s total opposites. Nevertheless, they have a common mission – to contribute to a better and more pleasant workplace and indoor environment. 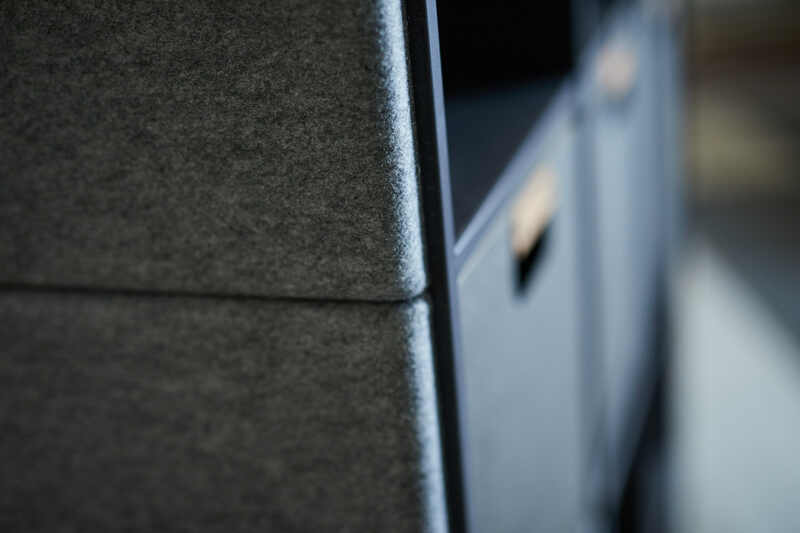 Limbus Subtle is a dense divider in furniture fabric with extra high sound absorption, and the Limbus GreenFrame is a transparent screen with lighting that creates well-being and comfort. 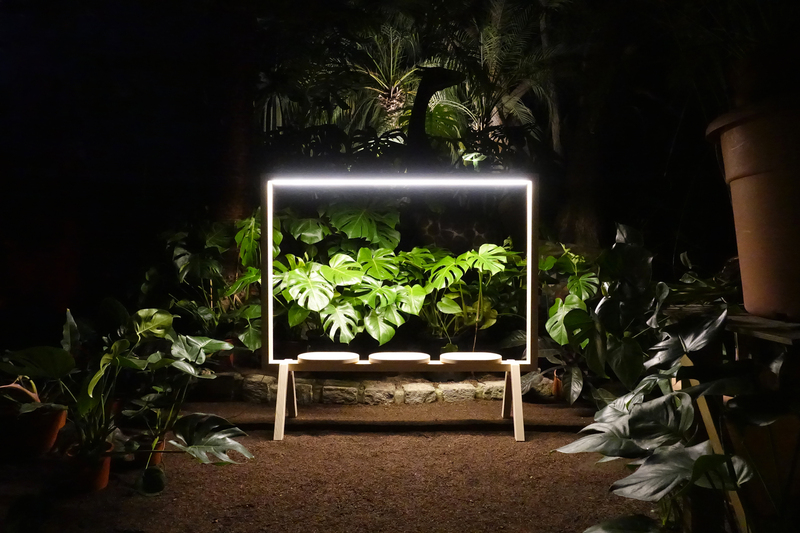 GreenFrame is made entirely in solid ash by advanced CNC milling, where both the luminaire, power cables and adapter are hidden in the frame itself, delivered ready-to-assemble. Plant saucers and legs are bolted underneath the frame, and a long cord with a foot switch allows you to turn on and off the light. On the three wooden plant saucers, potted plants can be placed and combined as desired with a maximum height to about 900 mm. Floor screen for potted plants, with integrated lighting. Lighting: Support light for plants; 24V LED Lighting 19.2 W/m, 3000K, white light. Frame: Solid ash wood 82 x 40 mm, with integrated aluminum profile for lighting. Pipes and power cables are concealed inside post. Actuator placed hidden under the frame. 3 m cable and foot switch. Legs: 420 x 300 x 40 mm in solid ash. The leg adds approx. 300 mm. Place for potted plants: 3 flowerpot saucers in solid ash 195 x 315 mm.